I’m very pleased to say that we’ve had our first Blackthorn & Brook article published in Foxhunting Life magazine online. 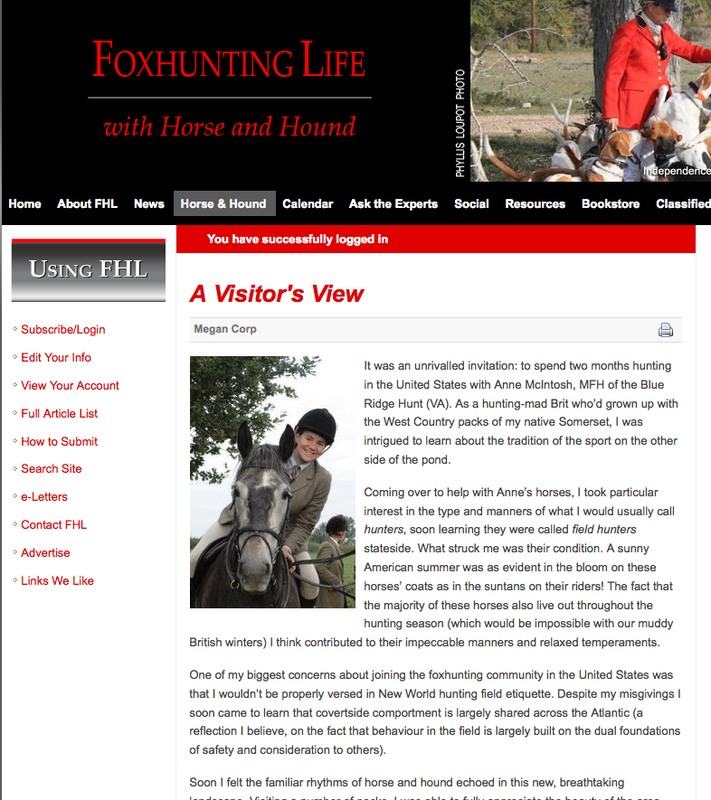 Megan’s article ‘A Visitor’s View’ draws a few parallels and contrasts between hunting in the UK and the USA. You can read it below. It was an unrivalled invitation: to spend two months hunting in the United States with Anne McIntosh, one of the masters of the Blue Ridge Hunt. As a hunting-mad Brit who’d grown up with the West Country packs of my native Somerset, I was intrigued to learn about the tradition of the sport on the other side of the pond. Coming over to help with Anne’s horses, I took particular interest in the type and manners of what I would usually call hunters, soon learning they were called field hunters stateside. What struck me was their condition. A sunny American summer was as evident in the bloom on these horses’ coats, as in the suntans on their riders! The fact that the majority of these horses also live out throughout the hunting season (which would be impossible with our muddy British winters) I think contributed to their impeccable manners and relaxed temperaments. One of my biggest concerns about joining the fox-hunting community in the United States was that I wouldn’t be properly versed in new world hunting-field etiquette. Despite my misgivings I soon came to learn that covert-side comportment is largely shared across the Atlantic (a reflection I believe, on the fact that behaviour in the field is largely built on the dual foundations of safety and consideration to others). Soon I felt the familiar rhythms of horse and hound echoed in this new, breathtaking landscape. Visiting a number of packs, I was able to fully appreciate the beauty of the area. Veiled in the misty haze of an early autumn morning, the Blue Ridge Mountains will take anyone’s breath away. A key difference is that much of the Virginia country is beautifully manicured, with post and rail fencing between lawns and paddocks. This contrasted with the more rough-and-ready farming background I am accustomed to, where a covert sometimes appears much less penetrable, and perhaps more inviting a hiding place for a fox. I think too that it is perhaps easier to find yourself ‘off-piste’ in the English countryside. One of the defining features of hunting at home is the variety of obstacles to test horse and rider. Walls, hedges and trappy places abound in the ancient agricultural lands of the west-country whereas a tidy wooden coop is a more common sight stateside. America’s open country was not just conducive to a beautiful view, but also to a great run. Virginia foxhounds are more lightweight than their cousins at home and I was particularly struck by the Orange County pack. These lithe tan hounds are a very different beast to their rougher British brethren, being better suited to crossing dry open country rather than the heavy going and dense coverts of South West England. So what of my companions in the field? I have always thought hunting people among the friendliest one can find, but this was my first time as a complete stranger to the field. Needless to say, I shouldn’t have worried. Not only did most of the field have their names handily engraved on the cantle of their saddles (which is very unusual in the UK), but introductions came thick and fast both in and out of the saddle. Just as in England, myriad walks of life are represented in the field and some keen sportsmen had travelled surprisingly far for their day. I’m a particular convert to the hunting Breakfasts provided after a day’s sport (an incentive to stay out all day!) as opposed to the British tradition of port and cake before proceedings at the meet. This tradition, I suppose, is testament to the longer, drier days of the East coast winter. As hounds go home in England night is often already falling, and the call of a log fire and slippers difficult to resist. My American hunting companions were immaculately turned out. I noted a penchant for more traditional versions of hunting attire among some members of the field, and particularly admired the heavier, baggier, button-legged breeches which suit the bitter American winters. I even took home two mementoes of the American dress – a pair of black leather boots and a polka dot hair ribbon given to me by generous members of the field. I now sport both at home in Somerset, and take great pleasure in recounting their origin when visiting in the North of England and in Ireland. As I write today, I am following the action at Royal Ascot – one of the highlights of the British racing calendar. Coverage has focussed on the talented filly, Black Caviar, who has flown from Australia with an unbeaten record of twenty-one races. She has come to face the finest of Europe’s sprinters, however, for me, the outcome of the Diamond Jubilee Stakes seems almost immaterial. The point that strikes me is that a filly, her jockey, trainer, lads and owners can travel to other side of the world and compete with the best of Europe in her own sport. Black Caviar reminds me of the privileged position we share in our great sport. Whilst the practicalities and settings may differ, the fundamental tradition and etiquette of fox-hunting transcend our local packs. Thanks to the unspoken laws of the hunting field, thanks to the solidarity of the chase and thanks to a common love of horse and hound, I felt a real sense of belonging during my stay in America and am eagerly anticipating my next sporting tour to the US.